Sabina and I are delighted to welcome you all here today to Áras an Úachtaráin as we celebrate the feast day of our patron saint, Patrick. Today is always, of course, an important occasion for Irish people at home and around the world, a time when our global Irish family join together to celebrate our Irish culture and heritage. 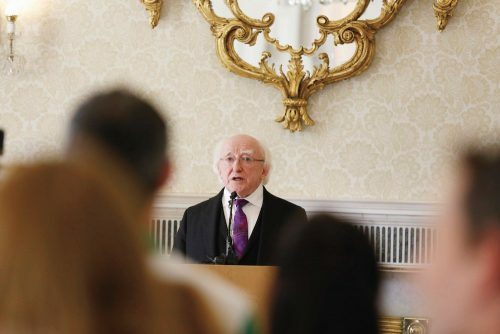 Here in the Áras, it is also a day when, in recent years, Sabina and I gather together groups of citizens who have made a special contribution to Irish life and to Ireland’s international reputation. Today we are delighted to welcome citizens who have excelled in science, technology, and in their application for the betterment of humanity. Science is an important and influential discipline – one which has a pivotal role to play in the great concerns of humanity in our time, and one which has the potential to make the greatest contribution to improving our world. I am particularly delighted that this year that we have some finalists of the Young Scientists of recent years who, when I visit their exhibition every year, indicate such an appreciation of the impact of science and technology on society. Science has become, of course, all the more valuable in a modern world as we work to locate science within a paradigm of sustainability. That is emphasised in the challenges set to us by issues such as climate change, global hunger and environmental degradation. These are, of course, challenges which call for creative solutions; solutions which can so often only be devised by those prepared to look beyond the limitations and horizons of the everyday as they seek to find new answers in an ever-changing world; by citizens who have that creative instinct and curiosity which is so essential if society is to continue to evolve and move forward in ways that are positive and enriching. Indeed, there is no doubt that creativity is a powerful and vital force in the field of science. The relationship between science and creativity is best understood as a reciprocal one but it is equally true to assert that science greatly empowers and enhances the work of our artists, our writers and our musicians. Indeed, we have ample proof of that in the room today and amongst our guests and performers are some of those artists whose work reflects the possibilities that can be realised when art and science converge. This is, of course, not a new or radical concept. There was a time when art and science had not yet developed into distinct fields, when both co-existed naturally, entangled in a relationship of perpetual exchange. Leonardo Da Vinci, for example used art as a tool to explore the world around him and indeed as an artist anticipated all kinds of extraordinary possibilities. He was not only a remarkable painter but also a great innovator, producing detailed designs for helicopters, submarines, diving suits and many other objects which continue to fire our imagination today. Da Vinci is, perhaps, the best known of those pubic figures whose achievements have proved the complementary relationship between art and science. However, there are many others. How many people know, for example, that Albert Einstein was an accomplished musician; that Hollywood actress Hedy Lamarr invented an early technique for spread spectrum communications, which are so essential for wireless communication; that Richard Feynman played the bongo drums; that Beatrix Potter produced significant writings in the field of mycology; or that Brian May, lead guitarist of the rock band Queen is also an astrophysicist. But perhaps I am trying to surprise the wrong audience here today. I have no doubt that all of you are very aware that the science laboratory and the artists’ studio are both spaces of wondrous exploration, where first steps are taken towards unknown destinations, and where new ideas are developed as questions are asked to which there is, as yet, no definite answer. Unfortunately, despite the myriad evidence to the contrary, the erroneous perception has developed that art and science are two distinct and discrete fields; polar opposites even, and that you must necessarily lean towards one or the other but never both. Artists and scientists know that this divide is a mythical one – that scientists spend much of their time devising creative solutions to the challenges of life, that artists serve as great partners in the navigation of the scientific unknown, and that both groups occupy spaces which are ongoing journeys towards the finding of solutions to open ended questions. Thankfully, the misperception that science and the arts occupy opposite ends of the spectrum is being ever more strongly challenged by those who understand the great importance of the arts and the sciences coming together in order to drive innovation and realise all that might be possible in a modern world. There has been much focus, in recent years, on the importance of Science, Technology, Engineering and Mathematics at second and higher level education. This focus is, of course, greatly justified in a modern society where the teaching of these disciplines is absolutely critical. We know that knowledge based economies are greatly reliant on the number and quality of STEM graduates that such societies produce. We also know that modern democracies, as they engage with global issues such as climate change, sustainability and food security, require citizens who are scientifically literate and can combine technical knowledge with decision making skills in addressing these challenges. Today, however, that focus has been broadened and there has been significant discussion on the necessity of according the Arts equal significance in our education systems, recognising the importance of creativity in enabling innovation. By giving Arts that equal position, by effectively moving from STEM to STEAM, we are making a vitally important connection between disciplines that had sadly come to be viewed as opposite, indeed almost conflicting, fields of expertise in a modern world. In making that connection, we are taking a critical step forward towards ensuring that our education system enables our citizens to develop the full set of intellectual tools necessary to address the great challenges of our time. Independent thought, a critical turn of mind, a will to question the status quo, an ethical concern with the community and the planet, these are all characteristics shared by the scientist and the artist; characteristics necessary in citizens who have the drive and vision to craft a better and more equal world. Already much work is being done in our classrooms and our universities, and of course by other interested groups, to bring together the vocabularies of science and art, and to dismantle any false barriers that have been placed between them. Indeed, it is most encouraging to know that Innovation 2020, Ireland’s current strategy for Research and Development, Science and Technology states that any future strategy for STEM in Ireland should take account of the STEAM hybrid; and has proposed that the Royal Irish Academy take a formal role in advancing the thinking on this issue in an Irish context with the aim of influencing future policy decisions regarding STEM education. That is indeed most welcome news, that augurs well for the future of Irish education as an enriching and fulfilling experience. Mar fhocal scoir, is mian liom mo bhuíochas a ghabháil libh ar fad as teacht anseo inniu, agus sibh a mholadh don obair thábhachtach, chruthaitheach atá ar siúl agaibh; obair a bhfuil de chumas aici and domhain mórthimpeall orainn a fheabhsú agus a leasú. Finally, I would like to thank all those who have made today such a special experience: our wonderful entertainers who have provided such enjoyable proof of the integral relationship between science and art, the first aiders and, of course, the staff of the Áras.